TGR-1202 hydrochloride is an orally available, next generation PI3Kδ inhibitor, inhibits PI3Kδ activity in enzyme and cell based assays with IC50 and EC50 values of 22.2 and 24.3 nM respectively. GNE-317 is a potent PI3K inhibitor that can cross the BloodÂ brain barrier; shows potent suppression of the PI3K pathway in the brain of mice with intact BBB. LY3023414 is an oral ATP competitive inhibitor of the class I PI3K isoforms, mTOR and DNA-PK, extracted from patent WO/2012097039A1, compound example 1, has an IC50 of 64.9 nM, 42.1 nM, 10.6 nM, 19.1 nM for Akt1(pT308), Akt1 (pS473), P70S6(pT389), S6RP(pS240/242). ON 146040 is the first dual PI3K and BCR-ABL inhibitor that targets the STAT3 and STAT5 pathways; inhibits PI3K α/δ isoforms with IC50 of 14/20 nM. PI4KIIIbeta-IN-10 is the most potent PI4KIIIbeta inhibitor currently reported, with very minor off-target inhibition of PI4KIIIbeta related lipid kinases (IC50 = 3.6 nM). PI4KIIIbeta-IN-9 is a potent PI4KIIIbeta inhibitor (IC50 of 7 nM) and is >140-fold selective over PI3Kgamma and >20-fold selective over PI3Kδ, and shows no inhibition of vps34 at concentrations up to 20 uM. ETP-46321 is a potent and orally bioavailable PI3K α/δ inhibitor with potent biochemical and cellular activity and good pharmacokinetic properties (PK) after oral dosing. GDC-0084 is a phosphatidylinositol 3-kinase (PI3K) inhibitor with potential antineoplastic activity. NVP-QAV-572 is a potent PI3K kianse inhibitor with IC50 of 10 nM. PI3Kα inhibitor 1 is a PI3Kα inhibitor extracted from patent US/20120088764A1, compound 243, has an IC50 < 0.1 uM, PI3Kα inhibitor 1 also inhibits HDAC (0.1 uM ≤ IC50 ≤ 1 uM) . PI3Kγ inhibitor 1 is a potent PI3Kγ inhibitor. SAR245409 is a PI3K/mTOR dual kinase inhibitor XL765 is an orally bioavailable small molecule targeting the phosphatidylinositol 3 kinase (PI3K) and mammalian target of rapamycin (mTOR) kinases in the PI3K/mTOR signaling pathway, with potential antineoplastic activity. TGR-1202 is an orally available, next generation PI3Kδ inhibitor, inhibits PI3Kδ activity in enzyme and cell based assays with IC50 and EC50 values of 22.2 and 24.3 nM respectively. PQR309 is an orally bioavailable pan inhibitor of phosphoinositide-3-kinases (PI3K) and inhibitor of the mammalian target of rapamycin (mTOR), with potential antineoplastic activity. PF-4989216 is a potent and selective PI3K inhibitor with IC50 of 2 nM, 142 nM, 65 nM, 1 nM, and 110 nM for p110? ?, p110? ?, p110? ?, p110? ?, and VPS34, respectively. VS-5584 is a novel and highly selective PI3K/mTOR kinase inhibitor for the treatment of cancer. HS-173, a novel phosphatidylinositol 3-kinase (PI3K) inhibitor, has anti-tumor activity through promoting apoptosis and inhibiting angiogenesis. Panulisib is a potent and selective imidazoquinoline based PI3K inhibitor with potential anticancer activity. AZD8186 is and inhibitor of the beta isoform of phosphoinositide-3 kinase (PI3K), with potential antineoplastic activity. CAL-130 Hydrochloride is a novel phosphoinositide 3-kinase (PI3K) inhibitor. It is reported that combined inhibition of PI3K??/?? as therapy for T cell acute lymphoblastic leukemia (T-ALL). NVP-BKM120 Hydrochloride is a selective PI3K inhibitor of p110??/??/??/?? with IC50 of 52 nM/166 nM/116 nM/262 nM, respectively. Reduced potency against VPS34, mTOR, DNAPK, with little activity to PI4K??. PI103 is a potent inhibitor with low IC50 values against recombinant PI3K isoforms p110alpha (IC50= 2 nM), p110beta (IC50= 3 nM), p110delta (IC50= 3 nM), and p110gamma (IC50= 15 nM), less potent to mTOR/DNA-PK with IC50 of 30 nM/23 nM. XL147 is a potent, orally bioavailable inhibitor of the class I PI3K family of lipid kinases. AZD8186 is an isoform-specific small-molecule PI3K inhibitor, potently inhibits PI3Kβ (IC50=4 nM) and PI3Kδ (IC50=12 nM) with selectivity over PI3Kα (IC50=35 nM) and PI3Kγ (IC50=675 nM). Acalisib is an inhibitor of the beta and delta isoforms of the 110 kDa catalytic subunit of class IA phosphoinositide-3 kinases (PI3K) with potential immunomodulating and antineoplastic activities. AMG319 is a potent and selective PI3Kδ inhibitor with IC50 of 18 nM, >47-fold selectivity over other PI3Ks. Phase 2. BAY 80-6946 is a phosphoinositide 3-kinase (PI3K) inhibitor with potential antineoplastic activity. GSK2636771 is a potent, orally bioavailable, PI3K beta-selective inhibitor. TG 100713 is an inhibitor of PI3-kinase that inhibits endothelial cell proliferation. CZC24832 is a selective inhibitor of PI 3-Kinase γ (IC50 = 1.0 μM in a PI 3-Kγ-dependent fMLP-induced neutrophil migration assay). IPI-145, also known as INK-1197, is an orally bioavailable, highly selective and potent small molecule inhibitor of the delta and gamma isoforms of phosphoinositide-3 kinase (PI3K) with potential immunomodulating and antineoplastic activities. BLY719 is an orally bioavailable phosphatidylinositol 3-kinase (PI3K) inhibitor with potential antineoplastic activity. PX-866 is a small-molecule wortmannin analogue inhibitor of the alpha, gamma, and delta isoforms of phosphoinositide 3-kinase (PI3K) with potential antineoplastic activity. PIK-90 is a synthetic phosphoinositide 3-kinase (PI3K) inhibitor with IC50 values (nM) of 11, 350, 18, and 58 for p110 α, β, γ and δ isoforms, low mTOR activity. PIK-75 is an imidazopyridine that selectively inhibits p110α with an IC50 value of 5.8 nM.2 It inhibits p110γ and p110β considerably less effectively with IC50 values of 0.076 µM and 1.3 µM, respectively. The S-enantiomer of A66 is a potent inhibitor of the p110alpha isoform of PI 3-kinase (PIK3CA). D-106669 is a highly potent and selective PI3K inhibitor, (PI3Kα IC50 <10 nM, >3 log selectivity against tyrosine or serine/threonine kinases, except ERK1 and 2). AS-604850 inhibited MCP-1-mediated monocyte chemotaxis with an IC50 value of 21 µM and reduced RANTES-induced peritoneal neutrophil recruitment in a murine model of leukocyte chemotaxis with an ED50 value of 42.4 mg/kg. CAY10505 is a potent inhibitor of PI3K, selectively inhibiting the γ isoform (IC50 = 30 nM) better than the α, β, and δ isoforms (IC50 = 0.94, 20, and 20 μM, respectively). 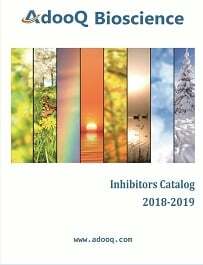 CH5132799 is a novel class I PI3K inhibitor, which exhibited a strong inhibitory activity especially against PI3Kα (IC(50)=0.014 μM). GDC-0032 is a potent, next-generation PI3 inhibitor targeting PI3 alpha. AZD8835 is a potent and selective inhibitor of PI3Kα and PI3Kδ with IC50 of 5.7 nM and 6.2 nM, with selectivity against PI3Kβ (IC50 431 nM) and PI3Kγ (IC50 90 nM). James T. Lynch, etc. Identification of differential PI3K pathway target dependencies in T-cell acute lymphoblastic leukemia through a large cancer cell panel screen. Oncotarget. 2016 Apr 19; 7(16): 22128–22139. IPI-549 is a potent and selective PI3Kγ Inhibitor with IC50 of 16 nM. MLN1117, also known as INK1117 and TAK-117, is an orally bioavailable inhibitor of the class I phosphoinositide 3-kinase (PI3K) alpha isoform with potential antineoplastic activity. PIK-III is a selective inhibitor of ?VPS34 enzymatic activity. Vps34-IN1 is a potent and highly selective Vps34 inhibitor with IC50 of 25 nM invitro,which does not significantly inhibit the isoforms of class I as well as class II PI3Ks.